It is perhaps the greatest real-life maritime mystery ever. The Mary Celeste was a merchant ship that left New York City on November 7, 1872, loaded with 1701 barrels of raw American alcohol bound for Genoa, Italy. 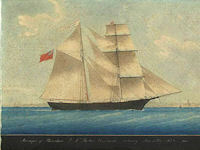 In addition to the captain, Benjamin Briggs, and a crew of seven, the ship also carried the captain’s wife Sarah and their two-year-old daughter, Sophia Matilda. Each member of the crew had an exemplary record and was considered and experienced, trustworthy and able seamen. On December 4, 1872 the Mary Celeste was found drifting in the Atlantic Ocean, unmanned and apparently abandoned. The ship appeared to be in perfect condition and still under full sail heading towards the Straits of Gibraltar. The ship still had over six months of food and water on board, and the cargo was virtually untouched and the personal belongings of passengers and crew were still in place, including valuables. The captain, his family, and the crew was never seen or heard from again, and what happened to them is often cited as the greatest maritime mystery of all time. The fate of the crew is the subject of much speculation. Theories range from alcoholic fumes to underwater earthquakes and waterspouts, along with a large number of fictional accounts such as aliens, sea monsters and the Bermuda Triangle. Many consider the Mary Celeste to be the ultimate ghost ship. Now, you have a chance to experience the mystery yourself in The Mystery of the Mary Celeste, a new casual adventure game from Merscom. In the game, you play the role of Mary Morehouse, an descendant of the person who discovered the original Mary Celeste, as she joins guests and crew of the Mary Celeste II on its maiden voyage. Shortly after the boat leaves the dock strange events start to happen. Explore the mysterious theories behind the disappearance of the original Mary Celeste while trying to save yourself from a similar demise. The Mystery of the Mary Celeste is an intriguing game that offers a mix of hidden-object and adventure-style gameplay. Download the game and try it for yourself. 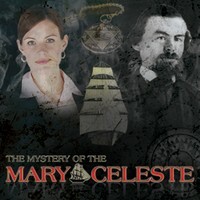 Learn more about The Mystery of the Mary Celeste!